Bruce Springsteen has played every kind of stage imaginable — hole-in-the-wall bars, 80,000-capacity stadiums, White House sitting rooms — and, as a bandleader in command of a sound as big as this country is wide, surveyed the expanse of America through hopes, dreams, and the subtle pull of the open road. He is a small-town mystic channeling the quiet truths of common people and broadcasting them worldwide, his chosen tools are his poet’s wit, his bullish voice, and the chameleonic grooves of his signature E Street Band. 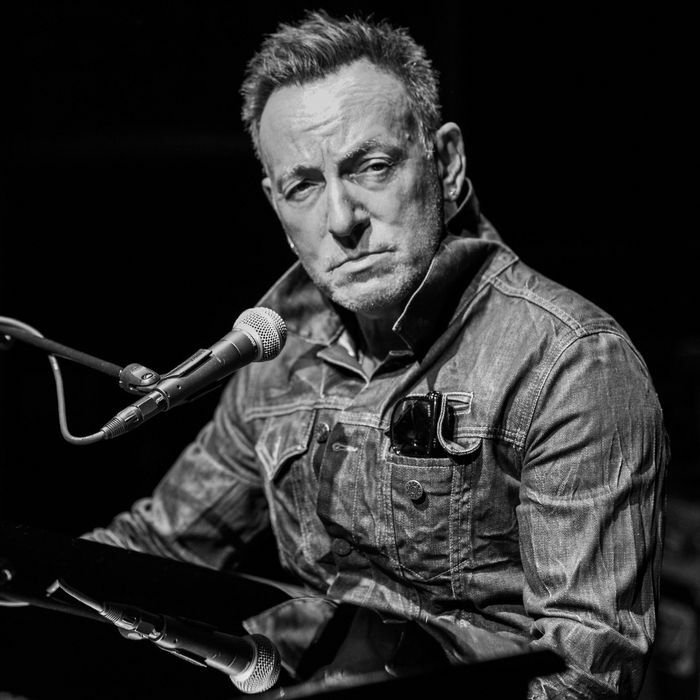 But last night, Manhattan’s Walter Kerr Theatre presented the Boss with a challenge he hasn’t yet tackled: static, reflective quietude. The Kerr Theatre is the site of the New Jersey bard’s new one-man-show, Springsteen on Broadway, which opens to the public tonight. For the next four months, he will rely not on the towering sonics of his favorite musicians or the twists of a discography that stretches back to the ’70s, but on acoustic guitar, harmonica, piano, and stories from his journey on and off the road. It is a performance not just of beloved big-hearted classic rock tunes but of the life of the troubadour in full. On Broadway weaves personal anecdotes, passages from the singer’s 2016 autobiography Born to Run, and stark solo performances of poignant songs from his back catalogue that bridge craft and creator into a seamless, theatrical presentation of self. It is not a hits revue, and it could be; Bruce has logged successful albums in each of the last five decades. On Broadway emotes best through small moments. Remembrances of Springsteen’s strict, brusque father and hard-working mother are punctuated by solemn renditions of the Nebraska deep cut “My Father’s House” and the ’80s B-side “The Wish.” Fallen E Street Band saxophonist Clarence Clemons is memorialized in a spirited “Tenth Avenue Freeze-Out” on vocals and piano. That’s not to say On Broadway isn’t stacked with hits; you come to a Bruce show, and you’re going to get “Thunder Road” and “Born to Run.” He toys with the arrangements, though, most notably on “Born in the USA,” the misunderstood ’80s classic famously co-opted by a Ronald Reagan presidential campaign that mistook its irony and solemnity for bare jingoism. “This is a protest song,” he said, announcing the tune. “This is a G.I. blues.” The pep was gone as he went through raga runs on a bottleneck and 12-string guitar before reimagining the verses and choruses as wounded Delta blues. The show’s balance of solo acoustic ballads and austere speeches about love and loss was frequently undercut by the iconoclastic snark of the man himself. The show isn’t afraid to go dark; death is a fact of life, as Springsteen acknowledges when he recounts narrowly slipping out of the Vietnam War draft and wonders who might’ve gone in his stead. But he keeps things light even when the details of the story suggest otherwise. The Clarence Clemons tribute is a tearjerker because in it, you see a rocker discovering and losing a crucial piece of his sound and missing a friend he thought he’d have for the rest of his life. But there’s no sadness in the tribute. The “Big Man” made people feel good, and “Freeze-Out” honors him by lifting spirits. On Broadway isn’t haunted by its ghosts. It’s an act of penitent commemoration. Near the end of the night, Springsteen recalls a trip back to his hometown, which, for all his signature drive and wanderlust, he can get to in a ten-minute trip from where he lives now. He performs a strange benediction for a big tree he used to climb as a kid, upon learning it was recently removed from the property. The physical form is gone, but the comfort and support he associated with it will last forever. The Broadway show might serve the same purpose for fans. It’s a rare opportunity to see the man up close in one of the smallest rooms he’ll ever play. As with any Springsteen stage performance, you learn that his voice and personality are much bigger than the body housing them. But Springsteen on Broadway is a poignant reminder that in spite of the myth and legend, Bruce Springsteen is made of the same blood, muscle, and bone, and motivated by the same fears and desires, as the rest of us.